Erasmus University Thesis Repository: The Politics of the Clean Development Mechanism: A ton of carbon here is the same as a ton of carbon there? The Politics of the Clean Development Mechanism: A ton of carbon here is the same as a ton of carbon there? This research paper explores how the Kyoto Protocol’s Clean Development Mechanism inserts itself in the antagonistic relationship of a green capitalism. While expanding the accumulation by dispossession forces of capitalism, is being considered legitimately green behind a face of apolitical and neutral. This mechanism is explored through two perspectives: a structural critique on the ideological underpinnings of it, and an actor and power analysis, which reflects the politics embedded within its privatized governance architecture. The CDM is considered instrumentally constructed in a process of neoliberal expansion and private governance within the climate change negotiations, as well as reinforcing the very social values that are the root of this environmental problem. 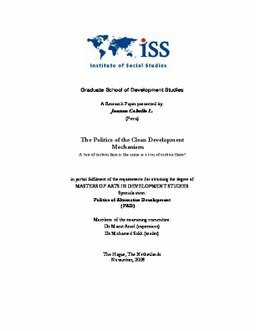 This paper tries to clarify how large investments in technological transfers to developing countries in the name of ‘sustainable development’ in exchange of carbon credits or ‘permits to pollute’ for industrialized countries is deepening the capitalistic process of accumulation by dispossession in a local and a global level. From an activist perspective, this paper hopes to contribute to the understanding of the changing configurations of power within the CDM governance so that structural changes on the power relations can be assessed for a transformative action.